A series of romances, missed chances, and disasters befall the lives of Joan Brendon and Alexander Luttrell in a real life game of snakes and ladders, as each falls for others who enter their lives at seemingly unpropitious moments. Tragic misunderstandings, old flames turning up on wedding days, and bizarre coincidences are all the result of a missed letter! 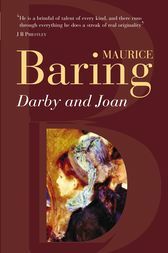 The Island of Malta features in this Victorian romance, which Baring based on a true story, providing insight into both the times and human strengths and weaknesses, before Darby and Joan end their days in happiness.